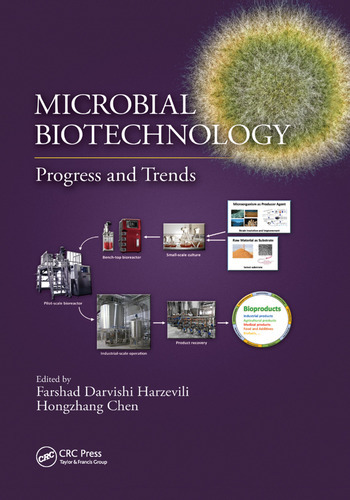 Microbial Biotechnology: Progress and Trends offers a theoretical take on topics that relate to microbial biotechnology. The text uses the "novel experimental experiences" of various contributors from around the world—designed as case studies—to highlight relevant topics, issues, and recent developments surrounding this highly interdisciplinary field. It factors in metagenomics and microbial biofuels production, and incorporates major contributions from a wide range of disciplines that include microbiology, biochemistry, genetics, molecular biology, chemistry, biochemical engineering, and bioprocess engineering. In addition, it also provides a variety of photos, diagrams, and tables to help illustrate the material. Students, scientists, and researchers can benefit from Microbial Biotechnology: Progress and Trends, a resource that addresses biotechnology, applied microbiology, bioprocess/fermentation technology, healthcare/pharmaceutical products, food innovations/food processing, plant agriculture/crop improvement, energy and environment management, and all disciplines related to microbial biotechnology. Dr. Farshad Darvishi Harzevili was born in Harzevil town, Gilan Province, Iran. He is a graduate of BSc biology at the University of Guilan. He earned his MSc and PhD in industrial microbiology and microbial biotechnology from the University of Isfahan. He is now a faculty member and head of the microbial biotechnology and bioprocess engineering (MBBE) group at the University of Maragheh. His main interest is in the biotechnological and environmental applications of yeasts to the production of biotechnologically valuable products. He is also interested in the expression of heterologous proteins, metabolic engineering, and the synthetic biology of yeasts. Dr. Hongzhang Chen is a graduate of Naning Forest University. He received his master’s degree in microbiology from Shandong University in 1991, and then obtained his PhD in biochemical engineering from the Institute of Process Engineering, Chinese Academy of Sciences in 1998. He is now a member of the Chinese Academy of Sciences and is vice director of the State Key Laboratory of Biochemical Engineering. His research is focused on ecological biochemical engineering and biomass refining engineering. Currently, his research explores new types of solid-state fermentation techniques, devices and processes, and clean fractionation using steam explosion techniques for efficient pretreatment in cellulose conversion to useful biorenewable materials.